It has been almost 6 weeks since I’ve posted anything, but that doesn’t mean no work is getting done. I’m busy writing a paper for the HARN/Swedish Institute Conference in October; working on a volume of edited correspondence (more on which later); and other summer activities like grants, reworking syllabi, and hanging out with my son and husband more. In two weeks I leave for Wyoming for a vacation–yes, VACATION. In the process of the above mentioned research, I’ve found a lot of really great stories that will be posted here in the coming weeks. One of the most fascinating is the story of the collection and installation of the mastaba tomb of Perneb at the Metropolitan Museum of Art. Thankfully, they tell their own story on their website. If you have any questions about anything at the MMA, their website is really good. They have videos, images, links for digitized documents, and great stories to tell. I’ve talked about the MMA before, so if you want to know some history and a museum review, I invited you to see that post. On to the Tomb of Perneb. 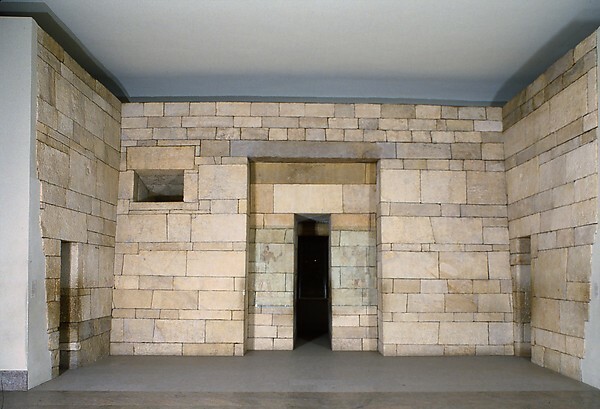 In 1913, an excavation led by Albert Lythgoe and the MMA dissembled the mastaba of an early Egyptian royal official (5th dynasty) in the Saqqara necropolis. It was the mastaba of Perneb (c. 2381-2323 BC), an official who functioned in the presence of the Pharaoh as his dresser, not unlike a valet. He was clearly a wealthy, high-status official and he was buried north of the Step Pyramid in Saqqara. 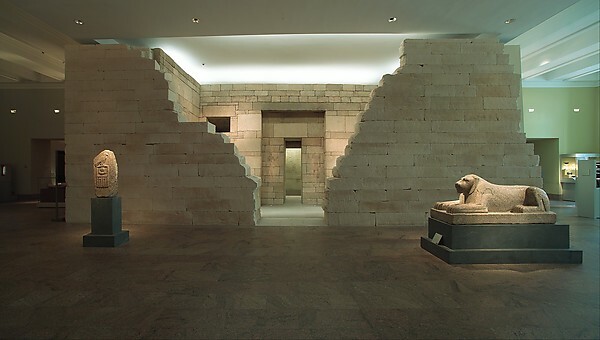 Thanks to the generosity of Edward Harkness and the Egyptian Government, the tomb was then brought to New York and reassembled in the Metropolitan Museum of Art’s Egyptian Art department. It took 3 years to reconstruct, and it opened with great acclaim in the winter of 1916. It has remained in the same place at the MMA since its installation, with some conservation and new construction in the 1990s-early 2000s. Curators argued that the presentation of the tomb people had seen for more than 80 years was not correct. Before screen wall was built (2003). Courtesy MMA. After screen wall built (2003). Courtesy MMA. The MMA made a short film in 2004 (around 20 min) about the tomb itself, and it is very well done. I can’t embed it, but you can view it here. It gives a history of the tomb, and a concise explanation of the purpose of tombs in Egypt. At around the 3:50 mark, there is a digital reconstruction of what Saqqara would have looked like around the time of Perneb’s tomb, and they show a reconstruction of the tomb itself. It is a fascinating video. Also available on the site is a digital document, the 80-page booklet that the MMA published about the tomb at the time of its opening in New York. Thank goodness for the internet! I’ve been looking for this book, but no one will send it out. It was written by Lythgoe, and the assistant curator of Egyptian Art in 1916, Caroline Ransom, later Mrs. Grant Williams. She spent hours on the administration of receiving the tomb, arranging for its installation, and planning for the opening of the tomb, on top of her other work. She did much of this while Lythgoe and others of his work crew (most, if not all, men), were in the field during the winters. I know about Ransom Williams’ role in this story because I am editing a collection of her letters, which I found in the archives at the Oriental Institute at the University of Chicago, where she got her PhD in 1905. If I didn’t have those letters (soon to be published in print form, hooray!! ), I wouldn’t know about her work at the MMA because almost no one talks about it–save for the Breaking Ground project I linked to above. She was crucial to the Egyptian Art department almost from its inception as the main administrator. Her title was Assistant Curator, but that was because Lythgoe was the Curator. The Curator’s main job at many museums in the late 19th and early 20th centuries was to lead excavations and bring home the pieces to build departments. That was what Lythgoe did. Ransom Williams’ job was to do almost everything else. Ransom Williams’ work here was central to the building of the museum, much like countless other women in other museums, labs, universities, observatories, and more, whose work is hidden by a male scientist. We cannot know the entire story behind Perneb’s arrival in New York without knowing about Ransom Williams’ work on the project. I will not go into detail here, but more posts about this will be coming as I work through the editing of her letters. I think I’ve said before that finding these women and having to talk about them is part blessing, part obsession. They are so hard to find in the archives, but they need to be found to understand their central importance in the building of archaeological collections, theory, and excavation. *Sorry for the lack of images. I included a lot of links this time, that link to images instead. Would love to know of any references she might have made to RUFUS RICHARDSON, who seemed to tolerate–to a degree–having female archaeologists at the school, or other family members. My great-aunt’s name was DOROTHY RICHARDSON (born in 1887). Hi Mr. Herron, WOW what a wonderful story! I would love to hear much much more. If/when you get the time, I’d love to take this to email. My email is: SheppardKA at mst dot edu (sorry for the spelling out, but bots, etc). I finished the letters and they were published by Archaeopress! I’m going to look up these people so I know more about them when I hear from you again.